You will be given a reference e-book to read which has 529 pages And the test will be based on that e-book , you can take final test within 1 year of purchase. International business strategy can be defined as a plan which is used to guide commercial transactions that occur between entities in various countries. It refers to the specific actions and plans undertaken by private companies with an aim of increasing profit. The majority of private companies deal with a minimum of one international business partner especially in their supply chain and in their attempt to establish a greater competitive edge. If you want to become part of an organization which has at least one international business partner, then you should consider earning your international business strategy certification as this will let you become more familiar about the political and legal systems, linguistic and cultural barrier and any other complex issues related to international trade. This will allow you to help the organization which you are a part of in achieving commercial success. If you are planning to take up an international business strategy course, then you should keep in mind that international business strategy runs with the help of three prevalent philosophies. The first is the industry-based philosophy which states that the conditions occurring in a specific industry can help in determining strategy. The second one is the resource-based philosophy which determines strategy by taking a look on the difference of specific firms. The third one is the institution based philosophy which states that an organization needs to supplement both the resource based and the industry based philosophies through accounting with an aim of evaluating vital societal differences. If you are planning to enroll in an international business strategy certification program, then you should know that Brainmeasures is your most reliable option. The reason behind this is that this online certification company continues to perform its operations through strict ISO standards so you have a guarantee that you will only be getting the highest level of training and the most legitimate and accurate information regarding the field. Learning more about international business strategy through the program offered by Brainmeasures increases your chances of becoming a part of any of the most legitimate and renowned international business at present. The international business strategy exam which you are required to pass before you can receive your certificate is of the highest standards since this was developed and closely evaluated by professionals. 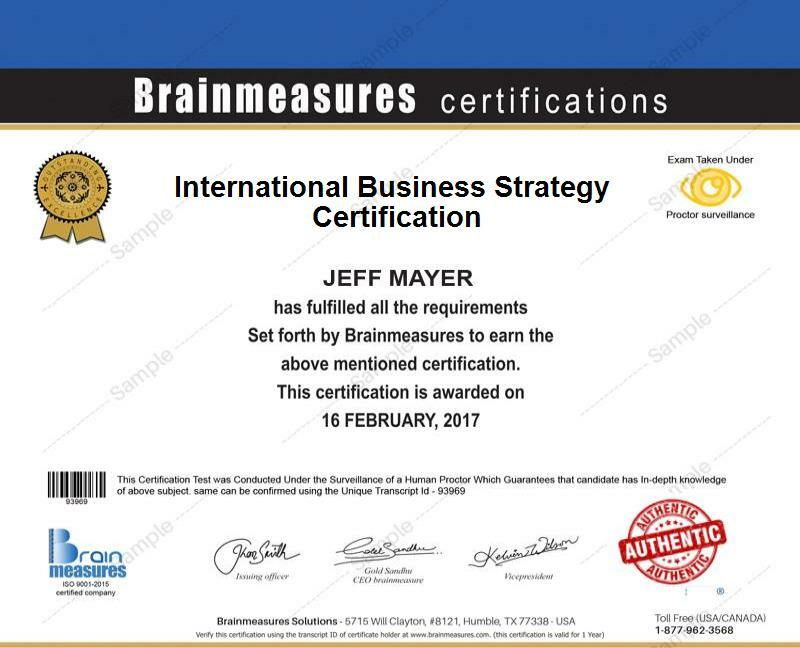 There are a lot of professionals who will be greatly benefited by the international business strategy certification program offered by Brainmeasures. These include senior and mid-level professionals who work in small, medium-sized and large business organizations who aim to effectively start or expand a global or international business. Brainmeasures International Business Strategy Certification program is so developed that anybody interested in attaining knowledge in this field can enroll in for this certification program as there are no standard qualifications required to enroll for this certification course program. Taking a hold of your international business strategy certification is a huge help if you want to improve your financial condition since you will be receiving a better figure for your annual salary. Your annual earnings will usually start from $48,000 and end at $151,000 depending on your level of experience in the international business strategy field and the position that you were able to fill.